Watchfire Digital Outdoor, manufacturer of the industry's best looking and most reliable digital billboards, announced the next generation of its digital billboards, which includes the use of the latest field adjustable super-efficient LED technology and a new cabinet design that reduces the board's weight by up to 12 percent. Watchfire's second-generation LED billboards allow outdoor operators to choose between a super-bright, super-vivid 7,500 NIT daytime setting for maximum impact or a setting as low as 5,000 NITs, which is appropriate in many situations and can save outdoor operators up to 40 percent on energy bills. The proprietary field adjustable daytime brightness control is available via Watchfire's Ignite® software, which allows outdoor operators to dial-in 100 levels of customizable daytime brightness. The second-generation digital billboards also feature a new cabinet design that reduces the board's total weight by up to 12 percent, bringing the weight of a 14' x 48' billboard down to just 7,000 lbs, including mounting hardware. The updated design allows streamlined installations and enables more existing billboard locations to be retrofitted without dramatic changes to the structure. In addition, the redesigned mounting system delivers much more flexibility at the job site for the installation crew. "The ability to run the boards at 7,500 NITs during the day produces an image that is incredibly vivid, with colors and images that pop off the board," said Watchfire Digital Outdoor director Darrin Friskney. "The new efficiency of the LEDs allow our customers to run at the 7,500 NIT level for the same power consumption as our first-generation boards, or run as low as 5,000 NITs and conserve a considerable amount of energy. The key is that we've put the control in the operator's hands to dial-in the perfect setting for their situation." 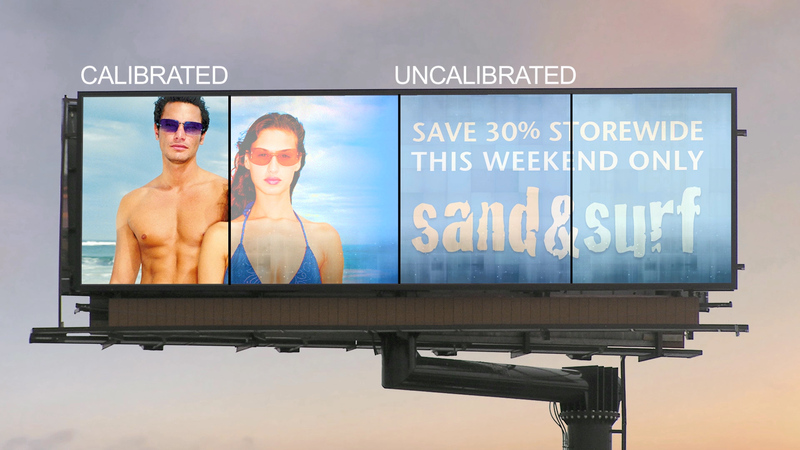 Whole sign color calibration for the smoothest, most consistent color across the entire billboard. Many manufactures only calibrate one module at a time, leaving a "patchwork appearance"-and some don't color-calibrate at all. Superior LED technology for outstanding color. Watchfire packs 768 LEDs into every sq. ft. of its 19mm billboards. In addition, Watchfire's palette of 281 trillion colors is the most in the industry. No air conditioning in any situation. This reduces cost and weight, as well as energy bills and service calls as compared to manufacturers who require air conditioning. Silicone gel encapsulation of each module to seal out moisture. This prolongs the life of the boards and improves reliability. The entire module, front and back, are encapsulated. Cabinet construction of heavy-walled, seamless, extruded aluminum for durability. Cabinets are braced and fully welded at each corner for a perfect fit. Fewer parts and connections for streamlined service reducing the likelihood of failures. Each module has only two connections and each pixel has only three LEDs. Automated sign diagnostics system provides real-time monitoring and reporting on sign "health." Intuitive programming of complex advertising schedules using Watchfire's Ignite® software. Ignite® also allows 24/7 monitoring via live web cam, proof of performance reports and automatic sign dimming, all with no annual maintenance fees and free Watchfire Help Desk support for the lifetime of the board. "The goal of Watchfire is to make it easy for an outdoor operator to be successful, and that's part of our second-generation product," said Friskney. "Whether its field-adjustable brightness, reduced weight, or constant innovation in our software, we want to work with customers who are interested in a good looking, reliable, easy to install billboard. In addition, Watchfire assists with all of the installation details, from coordination of subcontractors to managing timelines. We even include a Watchfire electronics technician at the job site for every billboard installation."